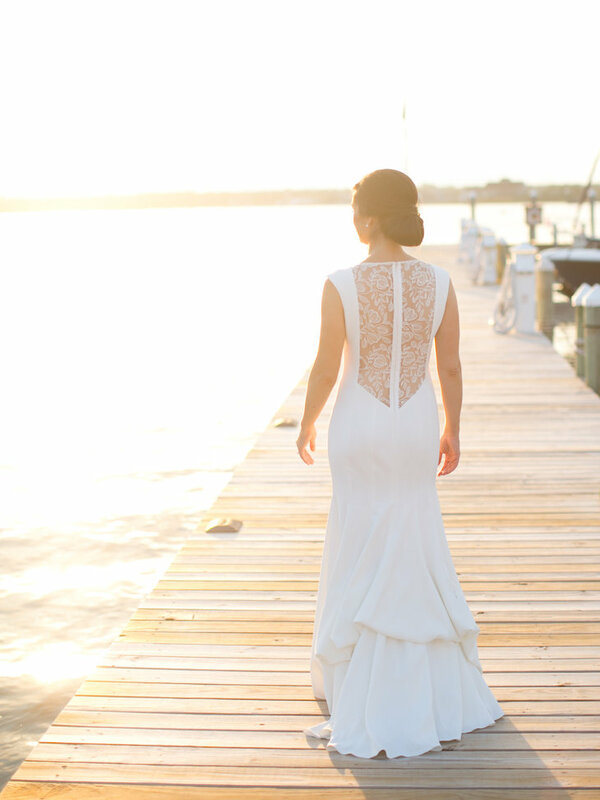 Pick which “style” beach wedding most speaks to you. You may not have even considered this before, but there are different styles of “beach”. It might mean something different to you depending on where you live. Living on the eastern shores of New Jersey, we have 130 miles of coastline spanning from Sandy Hook to Cape May. Each with their own unique landscapes, quaint towns and scenic views. However for some people, your beach style may mean bright sunset colors and palm trees. 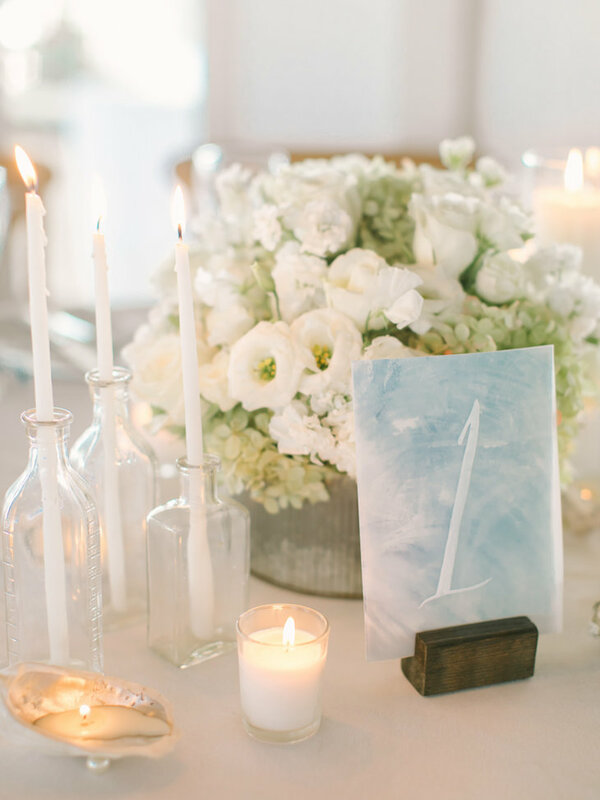 Before diving into how to design a chic beach inspired wedding, choose which style fits your vision. Stay true to the kind of elements you would find on that beach and it will come together seamlessly. Set the tone with your invitation. 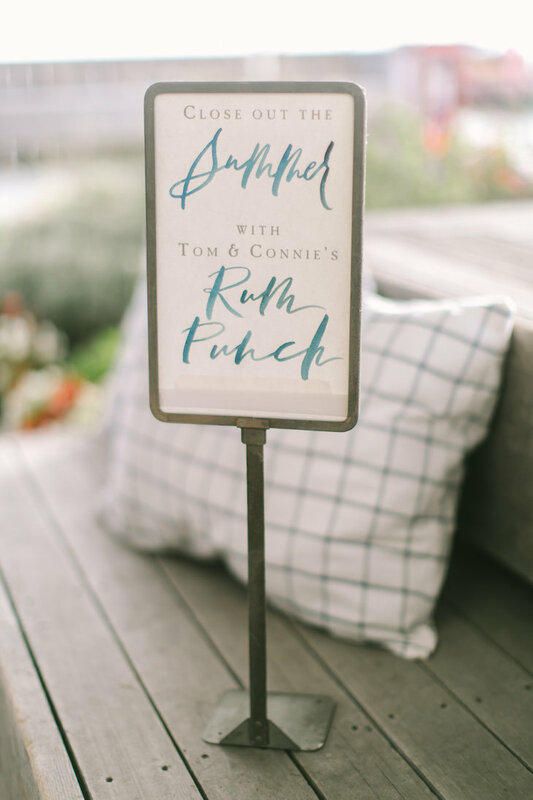 One of the best ways you can share your vision and communicate your beach wedding to your guests is through the invitation. 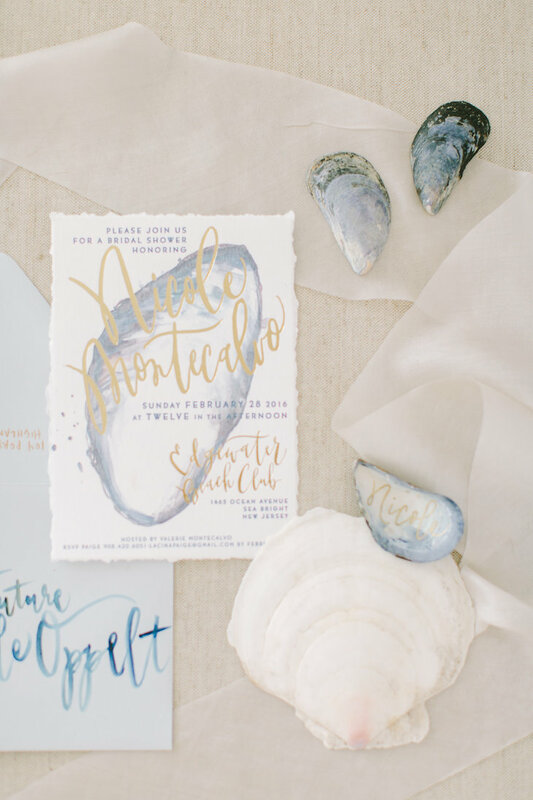 Whether you choose to be literal in your design by incorporating shells or landscapes or more abstract by incorporating watercolor elements of the sky and sea, your guests will be excited to see the design come together. It is also true that you invitation dictates to your guests the level of formality of the event, so keep that in mind as you incorporate your beach theme. Be inspired by the colors of the sea and sky. For any wedding design, it is wise to be inspired by your surroundings. 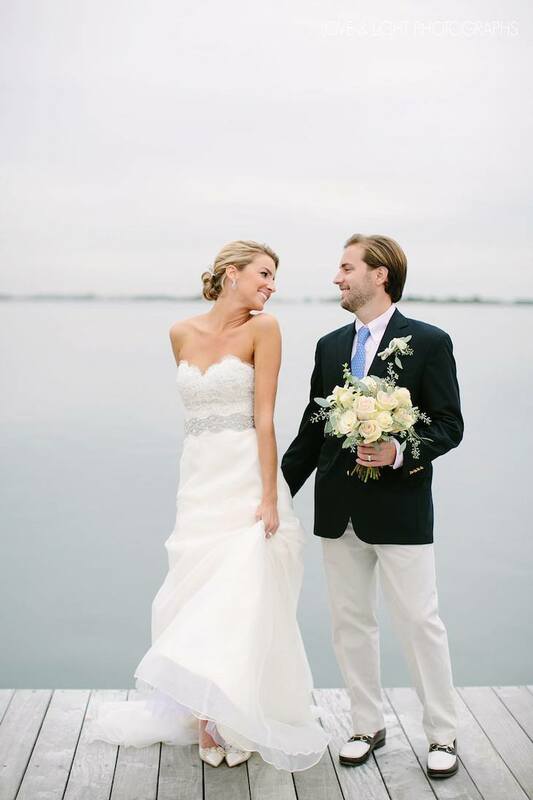 Beach weddings should be inspired by the myriad of colors found in the sea, sand and sky. 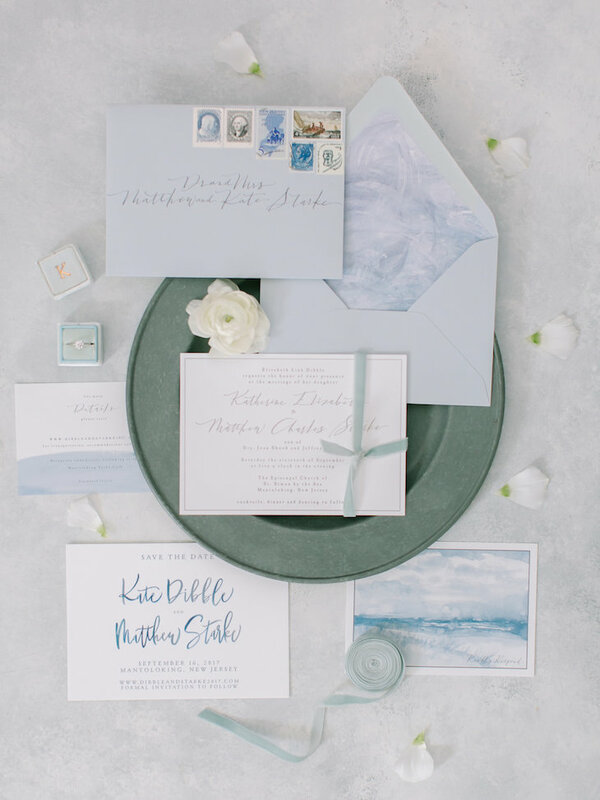 Shades of blue and grey read coastal weddings effortlessly and are so chic. They can be traditional, modern, fun and classic all at the same time. Use shells and other beach-inspired decor unexpectedly. 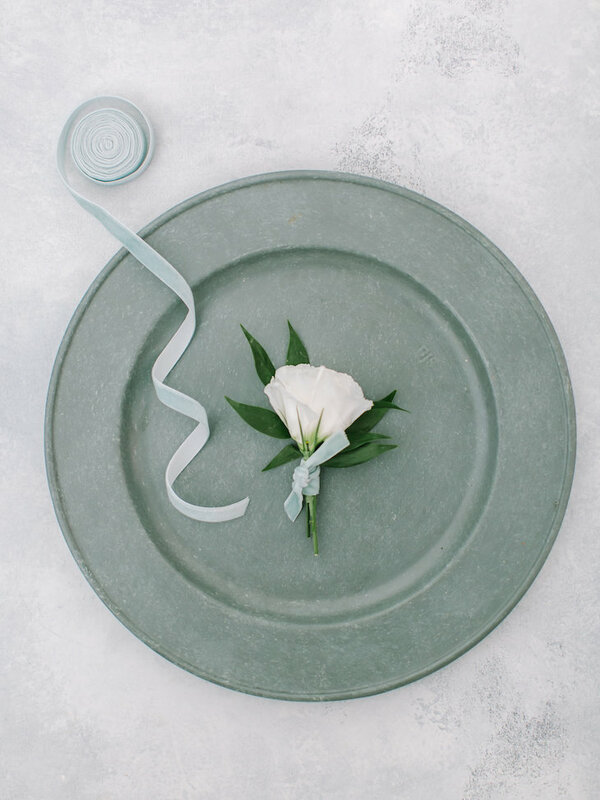 In order to create a chic beach wedding, try to incorporate the materials from the beach in unexpected ways. 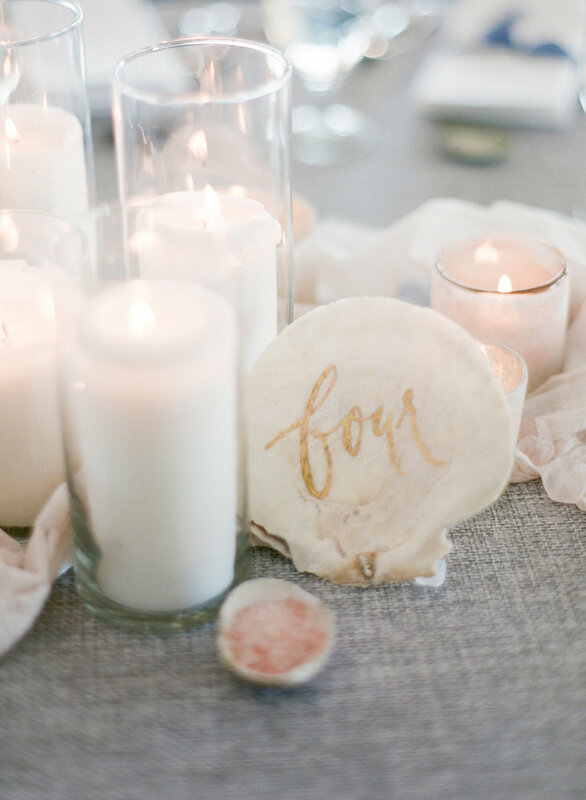 Seashells with calligraphy for table numbers, mussel shell salt cellars, oyster shell candles, and sea-glass inspired details. Beach weddings take on a more sophisticated approach when the details are understated and unique. Mixing different natural elements will make sure your beach wedding design is grounded and feels relaxed. 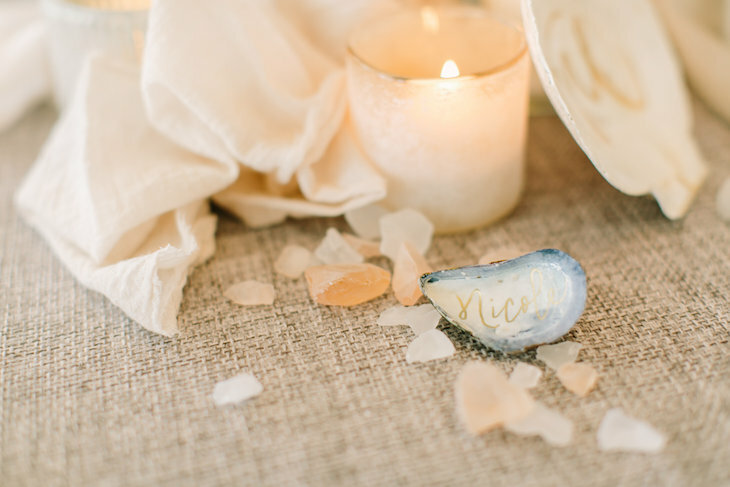 Using rocks, sand, textured linens and shells details is a great way to bring a beach vibe into your wedding regardless of your surroundings. When you think of the beach, you immediately conjure relaxation and putting your feet up. Within your wedding design, incorporate lounge areas that invite your guests to sit and relax awhile. 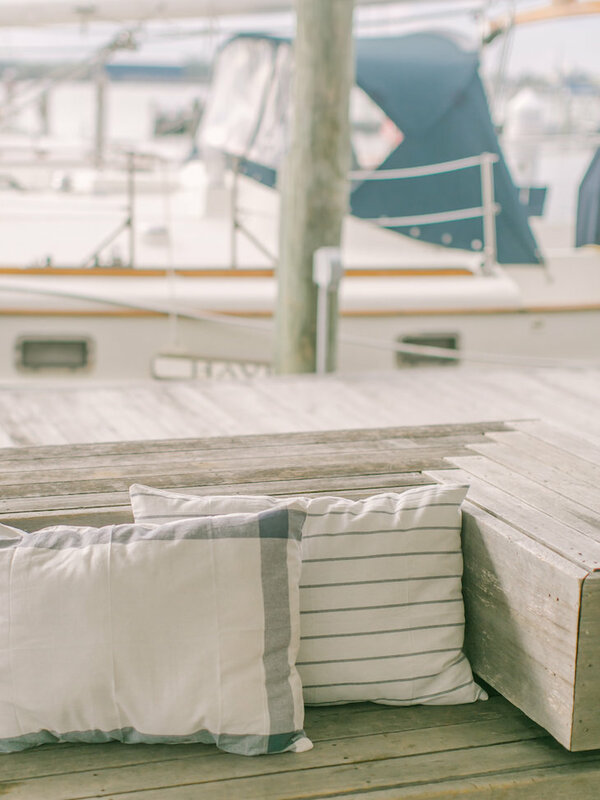 Whether they are on the water or just sea “inspired”, remember those natural elements and your color palette for a cohesive coastal look. Summer is full of the most delicious fruits, produce, sweet treats and of course cocktails. Serve your favorite summer treats during your wedding to remind your guests of a day at the beach. Whether it is a signature cocktail, succulent watermelon skewers or a good old fashioned ice cream truck. Make the food and drink part of the decor! Summer is all about the easy breezy lifestyle. That “just picked” or “just threw this on” way of life. Keep your flowers in the same vein. Using just one type of flower, large bundles of fluffy hydrangea, sea grasses or a wild flower bouquet all remind us of being at the beach. 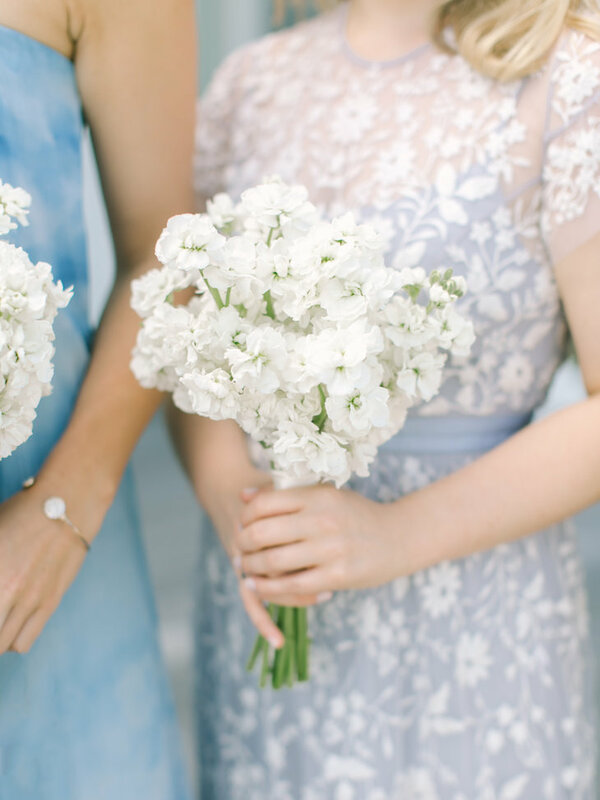 Simple, classic and easy is the way to go when it comes to your seaside flowers. 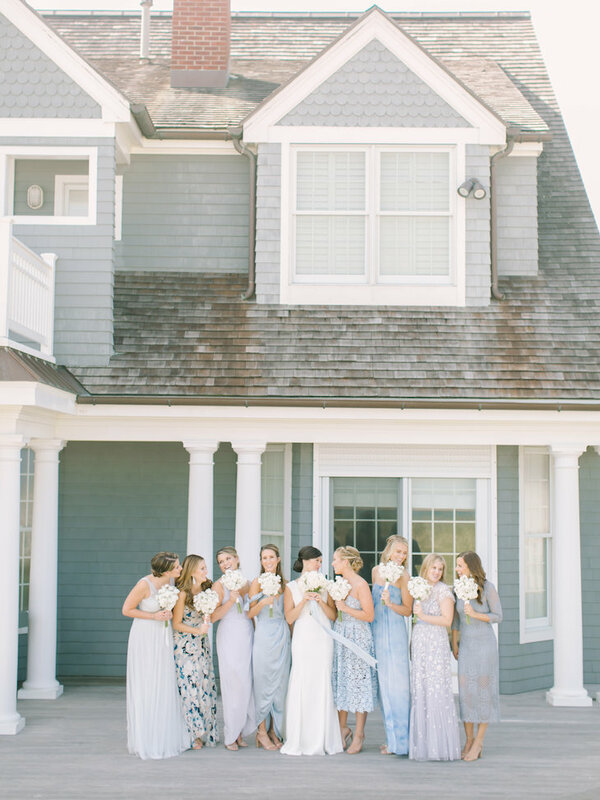 Just as the invitation and your flowers evoke the laid-back coastal vibe, remember that your attire should also be in tune with your beach atmosphere you want to create. Easy wedge shoes and lightweight dresses in the color palette work really well on the waterfront. After all, isn’t that what life at the beach is all about? Enjoy your wedding day and soak it all in. It goes way too fast.